THE USUAL REASONS for not flyfishing for largemouth bass go like this: I don’t know how. I don’t have the gear. The gear is too specialized. Bass is that other species you read about in fly fishing magazines; people don’t actually fly fish for them. I don’t have a big boat with a motor the size of a dishwasher and tons of sponsors to support me. I feel comfortable tying nymphs, dries and chironomids and don’t really want to tie flies the size of a small bird. I don’t want to risk a rotator cuff injury casting something the size of my uncle’s hair piece. I started chasing largemouth bass with a fly rod after many years of trout fishing. My first exposure, like that of most other Americans, came on Saturday mornings with Bob or Bill or Jim weighing his sack of fish during yet another Bass Masters tournament on a southern lake with a funny name. I remember the fish as always being monstrous, chainsaws with spiny rays, and the gear used unimaginably complex and varied, with lures diving down and up and sideways, hither and yon, flashing and sometimes squeaking, with fisherman poised seemingly right on top of the fish, yanking them from pond water choked with branches and roots and weeds and slime foul enough to gag an alligator. I also remember pictures in magazines, and one particularly fantastic photo of a largemouth bass pirouetting in the air with an almost equally fantastic man-made device dangling from its jaw. The impression was that these fish would fight on for a long time. A very long time indeed. Man against beast. Yet somehow those masters of the fish would yank them out of the water in just a few moments, raising them triumphantly by the lower jaw. Amazing. I was intimated by it all. But I learned too that, like lots of things, the myth is larger than the fish. Soon I began to devour books on bass, most of which placed bass fly fishing in a more realistic context with my other fishing. They invited me to the sport, reminding me of the all the nonsense that mega sports can become. I don’t have lots of strategies to download on you. There are too many books that can give you that. Read every book you can, especially those on the natural history of bass. There is a lot to learn, and it is fun learning, but it is not that difficult to catch bass. You might find yourself being more particular about the water you fish and more observant than when fishing for other species of fish, something more akin to a hunting frame of reference. Bass are the future of fly fishing. Well, maybe. Fly fishers are just beginning to see the tremendous advantages of fishing for bass. Bass are a modern fish, genetically speaking. They are a durable species, capable of living in the warmest and filthiest of pond water. In a sense, then, they are more advanced than trout, though this may be subjective biology. Certainly they are better than trout at doing a few things, like stalking and ambushing their prey, which consists of everything from trout-like fare such as chironomids and mayflies (yes, they’ll eat tiny stuff) to large frogs, popcorn and baby ducks. A baby duck would probably frighten a large trout to death. Pound for pound they fight harder and longer than any trout shy of steelhead size. Their somewhat flattened body makes them that much harder to fight with a fly rod, something akin to dragging a frying pan through the water. And who can complain about a bass exploding onto a surface fly like a triton missile? If you are going to catch a bass, act like a bass. This doesn’t mean you have to eat frogs and harass cute little baby ducks. But you need to think like a bass. When I talk to bass fishers, I often get a similar reaction. Fishing for bass inclines you to stalk them like they stalk their prey. Trout are more refined, gentle fish. Trout in a lake, you wait for; you can troll, but most lake trout fishing involves keying into the basic fact that the fish are on the move, cruising. They do some stalking, but they don’t have the explosive body/muscle type that makes a bass attack like a linebacker through the weeds and into their prey. Fishing for bass reminds me of fishing for trout in rivers. I enjoy anticipating where a trout lies, and then stalking them. Fishing for bass forces me to have a similar degree of awareness, observation and anticipation. I stalk them, I’m careful and quiet and patient, and I use all my senses just a little bit more than I am accustomed to. I try to anticipate any potential ambush point. A small rock pile. A stack of brush half-submerged in water. Logs diving into the water. And my favorite: yard-wide floating islands of tules and bulrushes. These little moving forests may not be ideal bass cover, but they fascinate me. Try picking one up out of the water, and you’ll see what a perfectly messy little moving shield they offer for bass. I usually fish the shady side of these little islands. The point is that the propensity of bass to lie in wait for their prey causes me to do the same. This way, I’m always anticipating something big about to happen on the water. Typically, though, I find myself more alone on bass waters than on trout waters, especially fly-only trout waters. It is a great thing that lakes can become catch and release (and a shame more bass water doesn’t), but once a lake becomes catch and release, it becomes marked. Which, again, is a good thing, but then all the fly fishers show up expecting great things. Days on bass waters tend to involve fewer people, with notable exceptions like opening day, pleasant warm summer weekends, and bass tournaments. I guess no article on bass is complete without some thoughts on bass gear and casting techniques. Bear in mind that like any writer, I can only offer my personal recommendations, and there are a large number of more studied authors out there. But that’s one of the nice things about fishing for largemouth: being “expert enough” means you can catch a lot of fish. For bass rods, I go pretty light. I often use the same six-weight I use for trout. To get started in bass fishing, you don’t need special gear. You don’t really need anything different than your regular trout gear (except for the flies, maybe). Keep in mind the limitations of light rods, though: small rods make it harder to cast those way-cool bass bugs the size of robins. I’ll fish a nine-weight rod (my steelhead rod) occasionally when I want to launch some bigger contraption I’ve devised, but normally I enjoy a lighter rod. I use a double-taper line because I don’t feel the need to cast long distances. Keep in mind though that any store clerk, when asked about bass fly fishing, will inform you that must have a bass tapered line or similar weight-forward line. It is a personal choice whether you choose to buy them, but the point is that you don’t have to have them, especially if your flies are, like mine, scaled down. The biggest fly I fish is a small thin Dahlberg Diver and numerous variations of my own that go by other names but are essentially still Dahlberg Divers. Some pop more on the water and dive less, as a result of slight tying deviations. Deer hair is the an ideal material for bass bugs because of the size of the bugs you can create and the endless variety of ways to trim the fly to suit your casting and your impression of what the bass wants to kill. If you try to tie something with dry hackle, you’ll end up wasting half a bird skin before you can get the thing to float well. Bass will eat small flies as well. I’ve caught many on size 12 zug bugs. It is a fun challenge because this kind of fishing tends to be very targeted. But you don’t want to randomly throw around small flies in a searching pattern, or you’ll spend the entire afternoon shaking off bluegills. The way to figure out how big a fly you can cast with a fairly light line is to tie a few bass bugs and take them on the water with a pair of fly tying scissors. After making a few casts, you’ll probably decide the bug is too big. Start trimming the bug until it begins to cast better for you, making sure to keep the general dimensions of the original shape. Or, don’t keep the general dimensions. Many a fly pattern was invented by trimming on-site and watching the new effect on the water, turning the pond into your laboratory. Bass aren’t too particular about a specific type of commotion on top of the water. If the thing moves, it will come. Some people spin on deer hair and don’t trim it at all, figuring, I imagine, that the messier and more chaotic the fly, the bigger the commotion and the more psychotic the bass will become. Smaller flies can create enough commotion on the water, but of course not as much as a buzz bait in the hands of caster with a 5:1 retrieve ratio on his reel. So there is probably no point in yanking the fly through the water until you feel a muscle strain. Moving a fly is only one strategy. The better tournament bass fishers have learned the lesson of slowing down the retrieve to a creeping rate. This kind of presentation is the stuff fly fishing is made for. Typically, I don’t move a fly at all once it hits the water. It just sits like something dead or confused until I grow a little impatient. Then I give it a single twitch. Then maybe another twitch or two. Then maybe a bigger yank after the opening strategies fail to lure a fish. Another strategy that gets me around casting issues is designing flies that have the appearance of size with very little weight and air resistance. 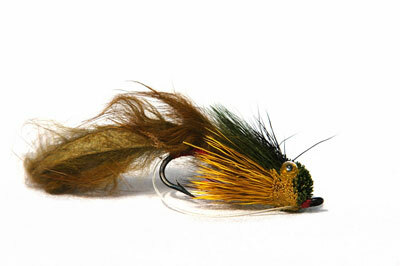 These usually sink very slowly and are made up of a closely trimmed marabou body with a single two-inch length of hen feather tied on as a tail — extremely simple flies, extremely thin and light weight, and very effective. Wooly buggers are similarly easy to cast, give the impression of a meat moving through the water, and are very effective against bass, or, as we all know, against almost anything else swimming. One of the best strategies to improve the casting of larger flies is simple: Practice your casting. A better casting stroke will cast a larger fly. But remember, you aren’t casting little olive duns out there, so don’t cast like you are. To cast a big fly, learn to be patient in your casting stroke. Learn to wait for the line to completely roll out behind you before launching the fly. In time, you’ll begin to feel the tug (sometimes a yank) of the fly behind you. The forward cast doesn’t need to be shot like a cannon, either. A lobbing type of casting can work very well, as long as you aren’t trying to cast 80 feet. If you want to cast a bass bug a long way, you should be fishing with your steelhead rod and probably overlining the rod a bit. Most bass, no matter the size, can be cast to from 20 to 50 feet as long as you are being very quiet on the water. Let the bug make all the noise, not you. So cast with confidence. In bass fishing, unlike trout fishing, thinking you’re going to get a grab takes you 80 percent of the way to success.